Q. How many self portraits can we get on to your school tea towels? A. Incredibly you can get up to 300 pictures on your tea towel, (our current record is 341!) however we recommend around 250. If you have a large school we would recommend doing 2 or 3 designs, such a design for Key Stage 1 and a design for Key Stage 2. Q. How does the pricing structure work? A. Our pricing structure is priced per design. 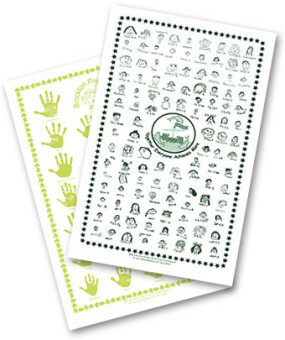 If you choose to have one design and order 300 Tea Towels you will be charged £1.40 per towel. If you choose to do 2 separate designs and order 150 of each we then charge £1.65 per tea towel. Prices are excluding VAT. Q. What price should I sell the tea towels for? A. There is no set selling price. Most schools sell the portrait tea towels for between £3 – £4, but schools have been known to charge up to £6 each! You can also come up with a special offer such as 3 for £10. Q. Can I send my artwork in an email or on digital format? A. Yes, we can accept your self-portrait school tea towels online via services such as WeTransfer or through email. We ask that the file is at least 300dpi and approx. 71cm x 43cm. Please send file as a PDF, Tiff, PSD, EPS, JPEG or Illustrator file. To reduce file size when emailing image can be saved as a ‘greyscale’. Please ensure all fonts are embedded. For best results use the FREE ART PACK! It’s free, simple to follow and there is no need for you to do any scanning in of images! You can leave that to us! A. We offer FREE delivery to UK addresses – we don’t believe in charging extra if you live in a remote areas. For consignments to remote areas please allow an additional 7 days for delivery. A. At Class Fundraising we pride ourselves on delivery. 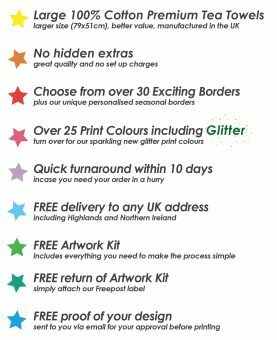 We normally make delivery from receipt of your artwork within 14 days. Please allow 3-4 weeks for Eco Bags. Delivery is made by courier, so we ask that delivery of your final order be made to a school address as it requires a signature. We make sure every order goes out on time, one thing we are not in control of is the weather. We aim to provide tracking information wherever possible. We also offer a before noon service, which is ideal for Nurseries and Pre-Schools, which is available for £5.00 + VAT per box. A. We require payment 14 days from receipt of goods. We will invoice you with your printed tea towels. You can make payment by cheque or by BACS (bank transfer). Q. What is the minimum quantity for repeat orders of the same tea towel designs? A. Our minimum order reprint starts from just 20 per design. A. We deliver to most countries within the EU – please contact us for delivery costs. All payment must be made before shipping abroad. Q. How do I get my self portrait school tea towels started? A. you can either get your free kit here, or you can call us on 01642 489000. We will dispatch your kit within 24 hours. If your question isn’t on here the please call or email us, or you can use the contact form.